A new study says much of Miami-Dade County will see the number of projected floods rise from 45 a year to 80 with a 10-inch rise in sea levels by 2030, and then accelerate to 380 instances of flooding a year by 2045. The Union of Concerned Scientists (UCS) came up with the projections using new data compiled by the Army Corps of Engineers. "In 2045, given normal variations in the tides, while some days would be flood-free, many days would see one or even two flood events—one with each high tide," UCS said in its report. 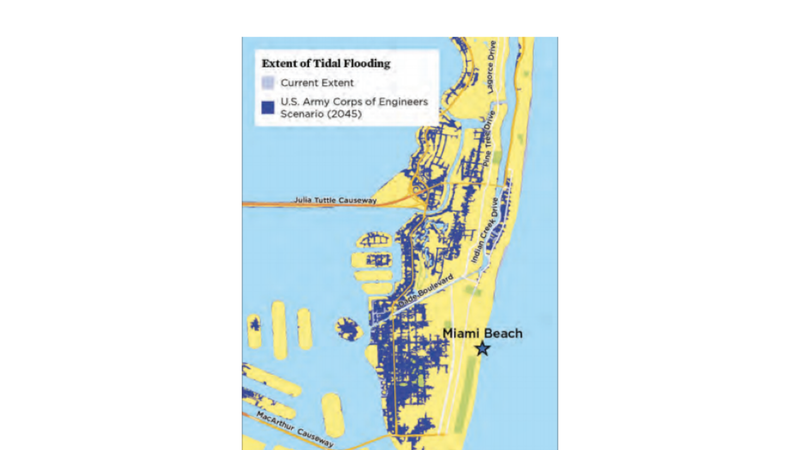 The findings jibe with another recent report from the University of Miami that since 2006, flooding in Miami Beach has soared 400% from high tides and 33% from rain. Last week, the National Oceanic and Atmospheric Administration released new flood maps that factor in population growth projections. They found that sea rise could force millions in Florida to adapt or flee. Previous estimates have projected $2.5 billion in real estate is at risk from sea level rise. UCS calls on more state and federal support to support local investments already underway, though as I have reported, the former continues to ignore pleas from South Florida. "Local action is not enough," UCS says.